Tech diving... conjures up images of extreme depth, no colours, torches the size of light houses and quite simply, bugger all to see! Well, I'm a tech instructor and proud of it (I am by the way also a PADI Course Director and I love teaching recreational too)! Yes, we are the equivalent of train spotters in the dive industry, however; we rock!!! We go deeper, get wetter for longer and let's face it, it's not really that difficult. And my God it's so much fun. 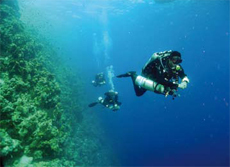 So far I have been caving in Mexico, Rebreather Diving in the Maldives and Deep Diving in the Red Sea. All very exotic I hear you say. I agree, so I recently started to do some tech dives in Gozo and Malta. Only three hours away, with flights from just about every major city in England including Gatwick, Heathrow and Stansted for those of us who live in London. Not only is it easy to get to, but the Maltese Government and Air Malta realise how important divers are to their economy so you get an extra 15 to 20 kilos for dive kit. Now that is awesome if you happen to be diving with 2 regulators on your back, 2 Oxygen regulators attached to your stage cylinders, a wing BCD and steel back plate, two surface marker buoys, two reels, two computers, two slates, lights, suit, boots, fins...oh, and two masks for good luck. So enough about all that, let's get down to the diving. The first site we dived, called Inland Sea was a perfect Decompression (45 metre max) stroke Extended Range (55 metre max) diving. The entry here is relatively easy for divers wearing twin sets as there is a slip way into the water where the stages can be left so they can be donned easily in the water. This is a beautiful site; the descent is made into a huge tunnel through a mountain connecting the inland sea to the real (!) sea??? Once under the water you are met with the most wonderful view of a huge cavern, the rock structures make you feel like you are in a cave when actually it's totally open above your head. The viz here is awesome and I have to say that made the Red Sea remind me of Wraysbury. In terms of doing a full blown tech dive it has it all, the bottom phase of the dive is done hovering over huge boulders and you can easily get 55 metres here. The decompression phase is really great as you can re-enter the opening to the tunnel and decompress while observing the rock formations silhouetted against the light filtering through this huge cavern. The second site was the Blue Hole. This is really quite challenging in terms of accessing the Blue Hole itself. There is quite a walk down a steep rocky incline and you really have to work as a team so as not to get into any bother. I have done this dive a few times and I can tell you this makes you realise how unfit you actually are. Adam, one of my team managed to perspire a can of Lynx here!!! Once you are in the water though, you realise why you went to all the bother. There are two ways to do this dive. One is to go through Coral Garden, which is stunning, shelves of rocks and overhangs everywhere and unbelievably for the Med, masses of fish. Again the bottom phase is all rock structures but the deco phase is bloody fantastic. Certain stops can be done in some of the caverns that abound on the Maltese Islands and then the final deco phase can be done in the blue hole itself which is awe inspiring. 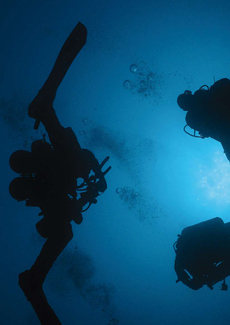 It is reasonably small as far as Blue Holes go but it's visually stimulating and gazing up at the surface and seeing other divers in all their tech gear hovering in the water silhouetted against the outline of the hole is breath taking. 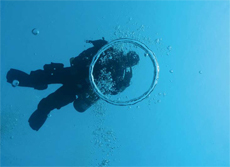 The other way to do this dive is to enter through the Blue Hole and make your way round to the entrance to the Inland Sea and deco in there as per the previous dive. There are many other incredible dives on Gozo in this depth range but these two were my favourites. After doing some really cool deep air dives, we decided to move over to the main Island (Malta) and do some seriously deep stuff. We started with a beautiful South Wold wreck at 72 metres. Now we have all been on wrecks, they have either been flattened by rough seas or pillaged for their artefacts. In Malta, if you remove anything from a wreck you can end up in jail, so can the skipper and the dive centre that organised your trip could lose their licence. Finally, the site is then pretty much forever closed. So in Malta, no one takes anything so the South Wold totally blew our minds. All the sea dives here are down a shot line, so it's incredibly exciting when you see the wreck appear beneath you. In fact with viz around the thirty metre mark in Malta, you get to see the wreck really quickly. And what a sight!!! The wreck sits perfectly upright on the bottom and still has two great anti aircraft guns on her stern pointing to the sky. The ocean floor is littered with unexploded shells and other debris left when she sank. Ascending over her deck you cruise over the guns and across the crew's quarters. Through the broken and smashed walls you can see the bathrooms and toilets, incredible. The ascent, a blue one and I have neverr seen such incredible azures. Our time hanging around the shot just melted away into the blue. We then decided to do a new unknown wreck which was incredible for us as we were amongst only a few divers to have ever dived here. We reached the wreck at 100 metres and thought we were all narced off our heads. It seems that the boat was made of stone? As it turns out, this is a rubble dumping ground from the main land. The sand and stone gave her a ghostly white appearance and as soon as our ten minutes were up we knew we had to come back again and try and find her name. The following day we dropped to 115 metres and attempted to see if we could get her name from the bow. In true tech fashion as we were having so much fun hovering in her upright shadow staring at all the green coral growing from her sides, we never made it there. So once again we ascended into the blue to do our decompression schedule. Wet notes were exchanged and it was decided that we had to get back here as soon as possible. Malta is littered with wonderful sites, from rock structures to caves to wrecks. There is something for everyone here, recreational or technical. And if you are lucky enough to be working with a dive centre as good as Gozo Aqua Sports then you are in for the dives of your life. So get your arse out there, I promise you will not regret it. If you are interested in any tech training or joining us on any of our trips to Malta, whether recreational or tech, please call The Diving Matrix on 07720 287 529 or send an email to Auntie Toomer.